Book by 30/04/2019 for travel between 01/09/2019 and 30/09/2019 and receive 20.00% discount. Book by 31/05/2019 for travel between 01/10/2019 and 31/10/2019 and receive 20.00% discount. Two bedrooms each with private bathrooms, Jacuzzis, and full size beds, a fully equipped kitchen, a living and dining area, with a third smaller bathroom, an adjacent balcony and terrace. Balcony or terrace with sun loungers overlooking resort pools. Townhouses with sea view (against supplement). Ground floor and resort views available. Townhouses with sea view against supplement available. Bathrooms are equipped with Jacuzzis for an indulging experience. For further information about the Monte Santo Resort and for alternative accommodation options, please visit our Monte Santo Resort homepage. GARDEN ACCESS ROOMS available for 1 and 2 Bedroom Suites (extra charges apply) Please ask for prices. Cot's (with linen) are on requests and subject to availability at the time of booking. First cot is FREE, extra cots are charged at £10 per night. Meal and/or Half board supplement exclude drinks. Children age 3-12 years will be charged at 50% of the above prices. All prices are PER NIGHT for the accommodation only. Villas are booked from 16.00pm on your arrival day to 10:00am on your departure day. Please note that availability shown is subject to confirmation - please call our reservations team. Praia do Carvoeiro is the place. Its name is nowadays usually simplified to Carvoeiro. Apart from its far-flung reputation, it has managed to keep a low profile, having spread sideways rather than upwards. Suburbs of good quality villas, many of them with private pools, have been built to the east and west of the village. There are a few good hotels in the vicinity, but essentially this is made up of holiday villas. It is very active in summer, but the villa shutters come down with the first signs of winter in early November and most of the neighbourhood goes into hibernation. 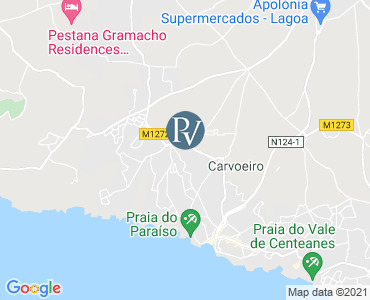 Carvoeiro is a relaxing location where the wild nights of other resort along the coast are replaced by fine dining. It has an excellent range of restaurants offering top quality food at reasonable prices. The steak here comes highly recommended. While lingering over a nice meal and glass of wine sounds like a perfect evening for some, others may be in search of something livelier scene. You'll find it at nearby Praia da Rocha. There is one notable area of continued activity throughout the winter and that is west of the village where the upmarket Carvoeiro Clube development maintains two excellent golf courses, the unique double nine-hole Quinta do Gramacho, and the pristine 18-hole Vale de Pinta.